With the clear disparity in wages, male workers earn $2.37 for eight hours of work. While female workers earn only $ 1.12 for the same work. 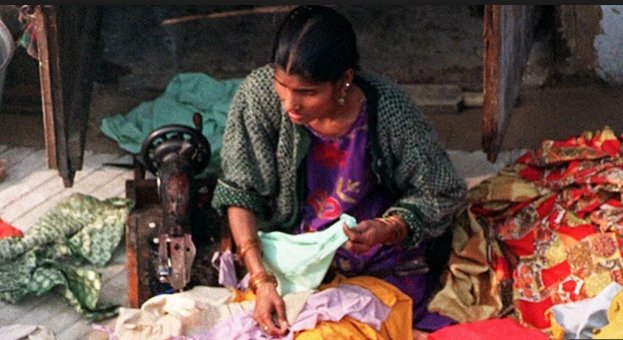 India’s home-based garment workers – majority of whom are women and girls – earn a meagre amount of $ .15 dollar per hour. A recent study by the University of California found that women and girls from the most marginalised communities are exploited by major Western brands. Child labour and forced labour were widespread, and wages were regularly suppressed in this unorganised sector. The works performed by these garment workers typically involves finishing touches on the garments such as embroidery, tasselling, fringing, beadwork and buttons. As many as 1,452 home-based garment workers were documented for this study. Though the report has not specified the names of brands, it says 85 per cent of the total workers have exclusively worked in supply chains for the export of apparel products to the United States and European Union, and the remaining 15 percent worked in a mix of export and domestic production. According to the report, 99.3 per cent of the workers were either Muslims or belonged to a heavily subordinated community – scheduled caste, and 95.5 per cent of the workers were female. Additionally, 99.2 per cent of the workers toiled in conditions of forced labour as per the Indian law, which means that they do not receive the state-stipulated minimum wage. In fact, most workers received between 50 per cent and 90 per cent less than the state-stipulated minimum wages. Most individuals worked for six to seven days per week, usually around six to eight hours per day. The youngest individual documented was 10 years old, and the oldest was 73 years old. 19.1 percent of workers documented in the North were children between the ages of 10 and 17, as compared to 11.2 per cent documented in the south. From among the 17.3 per cent child labourers in total, only about 42 per cent attended schools. If we consider the child labourers in South India, about 92 per cent of them are attending schools. While in north India, only around 33.6 per cent attend school. With the clear disparity in wages, male workers earn $2.37 for eight hours of work. While female workers earn only $1.12 for the same work. The workers have no social security. Almost none of the workers (0.1 per cent) received any sort of medical care when they suffered an injury at work, the report says. Injuries and chronic illness, including back pain, and diminishing eyesight, are very common among the garment workers. Around 23 per cent of these workers face chronic injury or illness. More than that, no workers belonged to a trade union, or had a written agreement for their work. The lack of unionisation and written contracts promotes the informal, shadowy nature of home-based garment work and allows many of the exploitative conditions, particularly the severe underpayment of the wages. The payments, which are less than a tenth of the minimum wage, are often late. However, the workers had been penalised for not completing the heavy orders on prescribed time. The situation worsens during the festive seasons, as the shops rush to meet heavy demands. With more than 12.9 million in the formal factory settings, the Indian garment industry is the second largest manufacturer and exporter after China. More than that, the Indian garment industry indirectly employs millions in informal and home-based settings. In addition to this, the report says, “9 percent of workers in north India toiled in conditions that constitute forced labor under ILO Convention no. 29. No workers in south India were found to be working in conditions of forced labor under international law.” In addition, “5.9 percent of workers in the north toiled in conditions that constitute bonded labor under India’s Bonded Labour (Abolition) Act, 1976. No workers in the south were found to be working in conditions of bonded labor”.